Part work of art, part object lesson in physics, a working camera obscura is a rare treat for anyone interested in learning more about the history of either profession. Based on the principle that light passing through a tiny opening in a dark room will be inverted on the opposing wall, the camera obscura is as mysterious as it is simple. 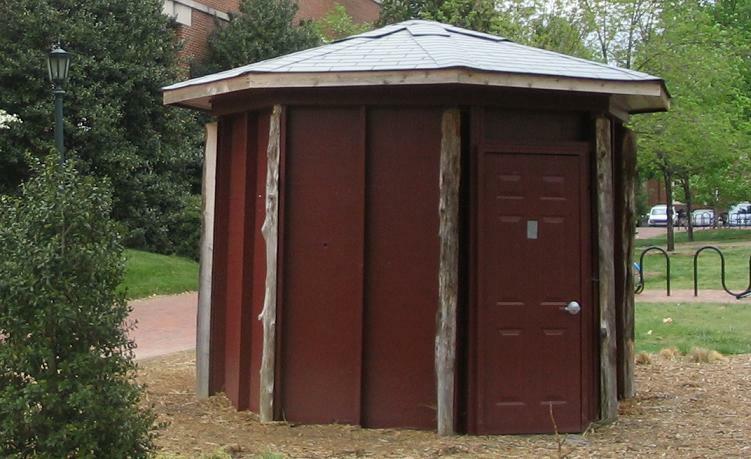 UNC is fortunate to have a working example of a camera obscura right here on campus. 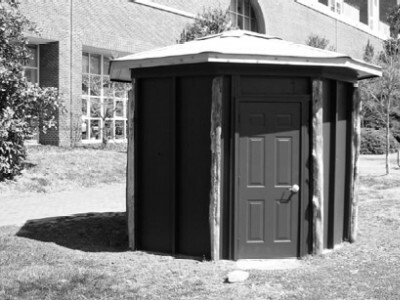 Located outside of the Hanes Art Center and Ackland Art Museum, the camera obscura is housed in a little red shed with a conical roof. This exhibit is open to the public, and there are instructions for how to obtain access posted outside the door. A key is kept inside one of the buildings, so the camera obscura can only be accessed during regular business hours. UNC’s camera obscura was the brainchild of Associate Art Professor Elin o’Hara Slavick, who constructed it with the help of a photography class.